Screen mesh hasn’t always been something used in residential and business structures. Screens first became widely used during the Civil War to keep bugs and similar pests out of buildings. After window screens and screen doors became widely used, there was a significant drop in the spread of disease. Our screens go unnoticed unless they aren’t doing their job; they serve us more than we realize. Before, we jump into the the purpose of rolls of screen, it is important to understand the basic purpose of screen itself. It is only due to our screens that we can open our windows or doors and let our home be refreshed with fresh air and the coolness or warmth of the outdoors. Though some small insects can still make it through some mesh—unless you install tiny mesh—our screening material keeps out those pests, such as flies and mosquitos that bring disease and destruction with them, outside where they belong. Our screens can, in some cases, protect us from the elements. Our stronger more durable screening materials such as super screen or pet screen, can withstand the abuse that forces of nature—such as hail—inflict on our screens. Heavy duty screens can also weather “forces of nature” such as the claws of our pets, squirrels and raccoons, and other furry friends who live in less urban areas. Home’s with missing, torn, or ill-fitting screens do not do well in terms of their of their resale value because replacing screens in contrast to other repairs is usually inexpensive. Having proper fitting screens, as well as ones that not only positively add to the overall aesthetic, but offer more than just the minimal protection from insect pests can contribute to the overall resale value of your home, business, and property. Unless you are a contractor who creates custom screens or someone who has constructed a screened-in porch, you may be wondering why someone would want to invest in window screen rolls. Buying in bulk and specifically buying large rolls of screen isn’t something that everyone needs. However, for particular projects or purposes, buying a screen roll might be in your best interest. Here are some reasons why you may want to invest in a roll of screen. If you are doing one small repair, then a whole roll of screen may be a bit too much, unless you prefer to have ample backup screen just in case. However, if you are someone who must succumb to repairing screens on a consistent basis or have a large window screen or screen panel that needs repair, then a screen roll may prove to be a worthy investment. Repair your screen door, large custom windows, or multiple windows easily with a window screen roll of your choice. Additionally, if you choose to repair your window screens or screen door instead of simply getting a completely new screen frame or door, you have the choice of using the screen material that will best fit your needs. Using screen rolls is the only choice that makes sense if you will be needing a large swath of screening material. Large scale projects can include, as mentioned above, large-scale repair projects, as well as screened-in porch projects. Though you can create a wonderful porch using premade porch panels, having the freedom to construct your own allows you to create a space that is truly yours. Depending on your accuracy and the scale of your job, if you invest in a screen roll, you may have all the screen you need. 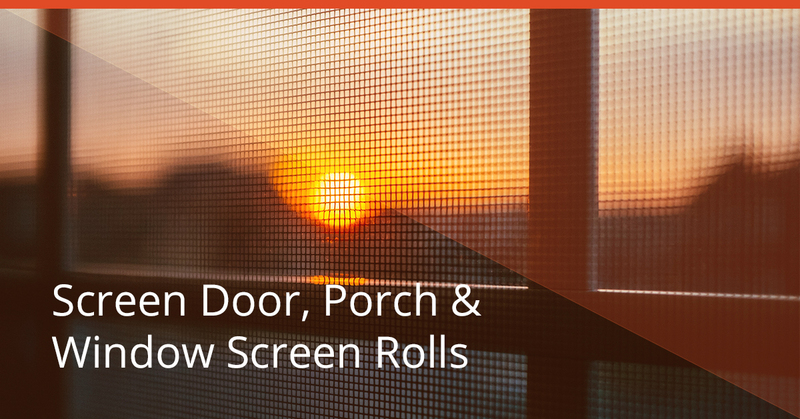 Window screen rolls are perfect for a contractor who specializes in creating custom window screens, screen doors, and installing screened in porches. Investing in a screen roll can also be a means for upgrading your screens. Does your pet always rip through your screen door or claw at your screens? Or, do you want to leave your windows open for fresh air, but are incredibly allergic to pollens and other respiratory irritants? Or maybe, you have a wonderful view out your window and hate that you have screens that impair your view. Because Metro Screenworks provides high-quality custom screen solutions, we offer a variety of screen types that are more durable than regular screens so they can withstand the wear and tear of our furry friends, you can open your window and enjoyed filtered air, or gaze at your million dollar view unimpeded by screen. Screens aren’t just something to keep the bugs out, anymore. Due to technological advancements, modern window screens and screen doors provide even more advantages. As alluded to earlier, window screen rolls are essential to accomplishing many custom screen projects. Due to the variety of roll sizes that Metro Screenworks offers, you are able to find a screen roll that will not only fit your project, but will also allow you the freedom to create the end product that you want.Though Metro Screenworks does offer other options such as pre-assembled window screens and screen doors, we also understand that often the projects that our customers need screen for are not so clear cut. For this reason, we offer screen rolls in a variety of sizes. Metro Screenworks strives to accommodate, homeowners, business owners, building managers, and contractors alike with high-quality and affordable screen products. For this reason, Metro Screenworks offers a variety of options that are well suited for contractors with our screen rolls being one of those options. The location in which your screen will be installed plays a key role in what kind of screen roll you will buy. If you will be installing your screen in your screen door, you may want to choose a different screening material than that which you would install in your windows and the same goes for the screen that you install in your porch. Also, you must think about what you want your screen to do for you. Do you need your screen to simply keep the bugs out, do you need it to block the sun’s UV rays, filter your air, or withstand heavy use? Where you install your screen will determine your need for durability as well as the climate in which your home or business is located. If you reside in an area prone to hail and other weather extremes, you may want to invest in a highly-durable screening material such as super screen. If your pets are constantly tearing up your screens, then it may be time to invest in screen that can withstand their pawing, clawing, and the occasional headbutt into the door. The aesthetics of your home can sometimes play a key role in the screening material that you choose. For example, a copper screen can be a visually pleasing addition, especially for older renovated homes or if you want to increase the curb value of your home, choosing invisible screen can be a wonderful option. If the way your window screen or screen door looks doesn’t mean anything to you then you can make your choice solely based on factors such as durability, and use needs. Price point may also be a determining factor that must be weighed in conjunction with your needs as you choose your screens. You may be asking yourself, how can I get the screens I need on my budget? Thankfully buying in bulk, such as a screen roll, can help you get a screening material that will do all that you need it to. One of the best upgrades that you can make for your home is to replace torn screens. We know that you probably don’t tear your screens intentionally, but that your torn screens are the result of the curiosity and clumsiness of our furry friends. Thankfully, instead of having to replace your window screens all the time, pet screen can keep your home safe from insects and four-legged pests, as well as keep your pets safe inside, and your screens looking nice. 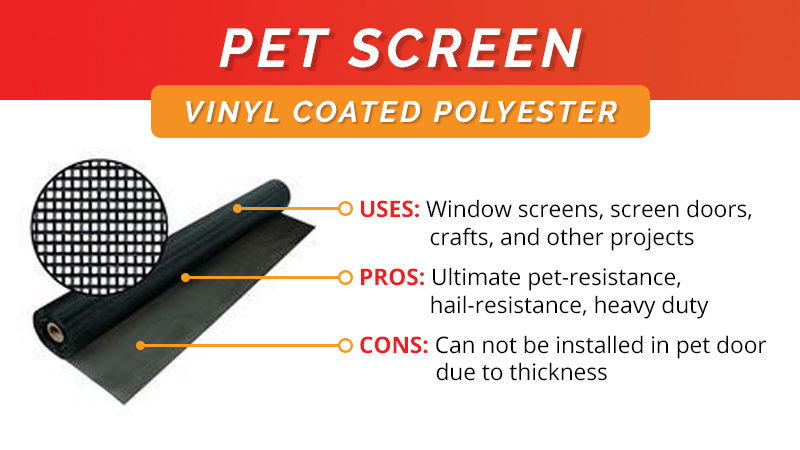 Pet screen is made of vinyl-coated polyester allowing it to be seven times stronger than regular fiberglass screening material. Our pet screen mesh is 15 x10, with a wire diameter of 0.25 inches. Though other screening materials are considered pet-resistant, pet screen is the most heavy-duty screening material on the market that was made for keeping up with the wear and tear of pet claws. Pet screen can save you money and time and the headache of continuous screen repair due to curious or overzealous pets, hail storms, and other use. Pet screen is the ultimate rugged and reliable screen. Pet screen can also be used in a variety of other projects including craft projects, barrier netting, automotive insect screen, playground netting, and more. As discussed above, pet screen can be used in window screens, screen doors, screened in porches and really anywhere that you would normally install screen. Despite its versatility, pet screen can not be installed in our pet screen door, due to its thickness. Super screen is a beneficial alternative. Super screen is another wonderful screening product which also provides reliable durability. Though not as heavy-duty as pet screen, super screen provides many perks including being the screening material that delivers the most benefits for your dollar. If you are looking to get a lot out of your screen and to avoid continuous repairs, super screen may be you next favorite home improvement installation. Super screen is a heavy-duty screening material that can be used for a variety of applications. Due to the strength of this mesh, super screen is pet-resistant, hail-resistant, and provides some UV protection as well. 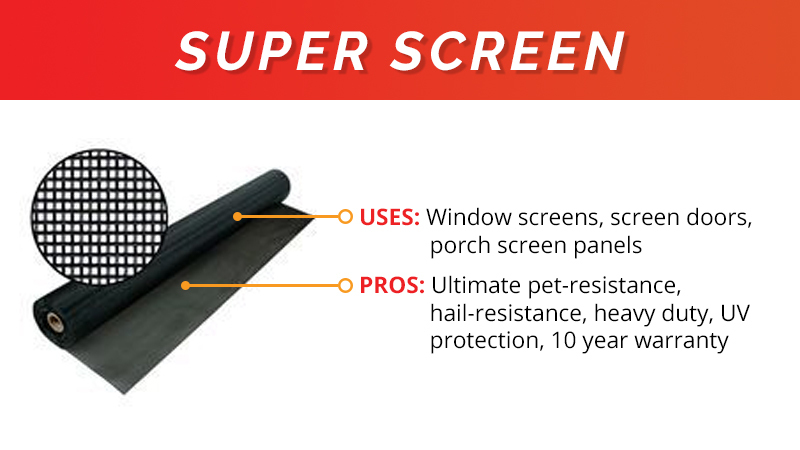 Super screen is a material that is reliable and provides multiple benefits including pet-resistance, hail-resistance, UV protection, and has a 10 year warranty. A super screen roll is a worthwhile investment. You can use super screen anywhere that you would install normal screening mesh including your window screen frames, screen doors, screened-in porch panels, and more. Copper screen provides durability and strength, as well as all the protection from insect pests that normal screen provides. With all of this, copper screen also adds curb appeal to any building and weathers to a dark, beautiful bronze color. Copper insect mesh can be a wonderful addition to any home, but can be an excellent addition to coastal homes and older renovated homes and buildings. Copper insect mesh is made of 90 percent copper and 10 percent zinc and has a 16 x16 mesh count. 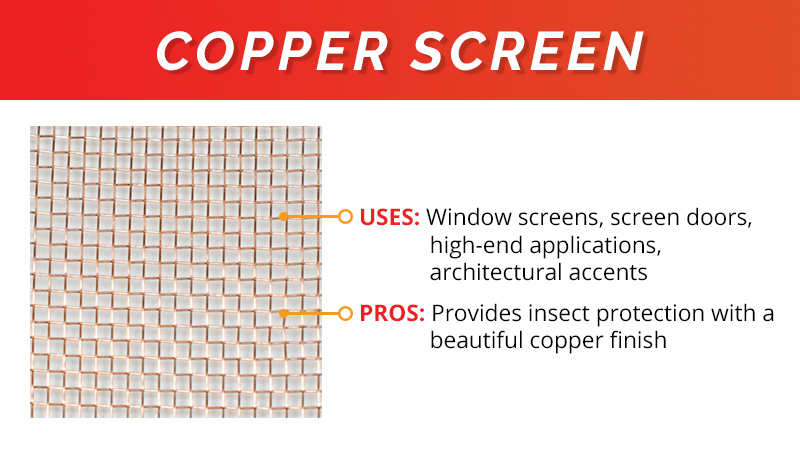 Like other insect mesh, our copper screen provides protection from large and small insect pests, but provides a beautiful finish to any home or business. Choosing copper insect screen is mainly for the purpose of providing a beautiful nostalgic finish to any screen application. Copper screen can also provide a beautiful look and flexible structure for high end applications or architectural accents. Copper mesh can be used anywhere you would use other screening materials. However, copper screen functions best for window screens and regular and custom screen doors in coastal and inland homes, as well as for architectural accents and other high-end applications. Our copper mesh can also be used to construct Faraday boxes as well. Solar screen provides all that you need in a screen and more. Solar screen, as the name implies, provides solar protection which can not only protect your you and the interior of your home from the damages that the sun can cause overtime, but also allow your home to be more energy efficient, saving you considerable amounts of money. We offer solar insect screen in a variety of strengths so that you can find one that fits your needs. Solar screen can be installed anywhere you would normally install screen. BetterVue is the window screening material that will add to your enjoyment of your view. We’ve all been there, wishing that we could better enjoy the million-dollar view out our window or door, but are unable to appreciate it to its fullest extent, due to our screens. BetterVue was engineered to provide homeowners, business owners, and others with screen that no longer obscured their view. BetterVue can be installed anywhere you would normally need a screen including large openings. UltraVue is very much like BetterVue, but is manufactured for small areas such as your window screen frame. Though UltraVue does provide a better view, you don’t have to worry about sacrificing quality, durability, and beauty. UltraVue makes a worthwhile and valuable upgrade for any repair or replacement window screen project and can significantly add to the curb appeal of your home. SeeVue stainless steel screen provides durability and strength, while also offering improved outward visibility. SeeVue screen works well in any screening application and when used with treated lumber. However it is not recommended in coastal areas. SeeVue provides all that you are looking for in stainless steel screen with the added perk of improved visibility. Install SeeVue in your screened-in porch panels and any other screen application. Do you ever want to open your windows or your door, but decide not to because of all the pollution, smog, and other allergens that are outside? RESPILON® did, too. Through the use of a new generation of nanofiber window membrane, RESPILON was able to give you window screens that allow you to live a healthier and safer life due to the ability to open your windows without worry. Use our air filtration screen in your window screens, screen doors, screened-in porches, and anywhere else you need to install screen. Maybe smog and pollution aren’t a worry where you live. However, pollen, dust, and other similar natural allergens wreak havoc wherever you step outside or open your windows. Our pollen filtering window screens allow you to have fresh air no matter what time of year it is. Though your visibility may be reduced slightly, when you install our pollen and dust-filtering screening material, you will be able to enjoy better air quality and lower AC bills. One of the main reasons why screen was invented was for the purpose of keeping out insect pests who are not only annoying, but can also spread disease. Though normal screens keep out most pests, some—particularly those tiny insects called with no-see-ums—sometimes still make it inside causing frustration and mess. If you are currently struggling to keep those tiny little six-legged annoyances at bay, it might be time to install tiny mesh. Due to its densely woven mesh, you can still enjoy all the perks of a screen, but without the discomfort of no-see-ums. Stainless steel offers durability and insect-resistance, and acts as a deterrent against vandals. As one of the toughest screen meshes on the market, stainless steel is used on government housing agencies and can withstand glass and rocks. If you are looking for protection against insects and other larger four-legged or two-legged pests, as well as durability, stainless steel screen might need to be your next upgrade. Stainless steel screen can be installed anywhere regular screen is installed. We at Metro Screenworks understand that you could buy your window screens, screen doors, and other screening parts and tools anywhere, so why choose us? We pride ourselves in offering high-quality screening products that allow you to not only get the best product on the market, but to also customize your window screen, screen door, screened-in porch to exactly your specifications. We offer our products to homeowners, business owners and building managers, contractors, and anyone looking for screens. Learn more about Metro Screenworks on our website and shop our inventory online. Want to know more about Metro Screenworks’ screening products, parts, and tools, how to replace your window screens, and other related topics? We post regularly on our blog about topics that we hope will inform, entertain, and inspire you in all of your screening projects. Read recent posts below or check out our blog for a specific topic!